For a modern-quality production build, the Eastman sits perfectly when you consider the construction style, fine attention to detail and the quality parts. Classic single-cut style - a very tidy guitar that sounds as good as it looks! If you don’t like old-school build, look elsewhere. More colour choice would be good. Choice is one thing the modern guitar market gives us in spades. Or at least that’s the way it seems. 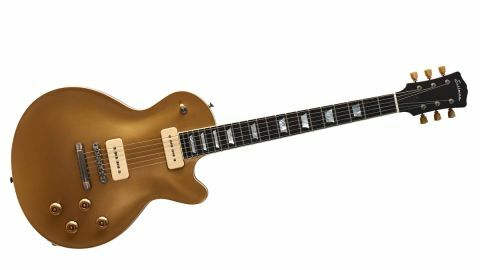 Recently, looking for a dual-soapbar P-90-style guitar, we were surprised by the lack of new guitar choice. Even Gibson’s 2019 range packs just one dual-P-90 guitar, the SG Special. Reverend flies the flag, Epiphone, too, in the lower end, but looking for a more serious electric we’re all too soon into custom-shop level ‘historic’ or reissue cost-a-lot-territory. Eastman’s hollow TV64 was one of our favourite guitars of 2018, and launched during that year was the SB56, a single solidbody model loaded with Lollar soapbars. Eastman’s vintage-aimed SB56 not only offers a period-accurate specification, but its new low-gloss ‘vintage nitro’ finish, paired with aged-looking hardware, creates quite the vintage-style piece that’s clearly inspired by the pre-humbucking Les Paul. The guitar features dual-soapbar single coils, modelled after Gibson’s classic P-90, and made by a premier pickup winders: Jason Lollar. If you have a taste for vintage and don’t enjoy or want to pay the prices of Gibson old or new, then Eastman will be on your radar. All that we’ve seen and played has been nothing short of exceptional for the money. This SB56 is no different with a beautiful vintage-style build: one-piece mahogany neck and back, for example, a lovely big neck, extremely tidy fretwork, 17-degree headstock rake, an excellent setup and a near perfect weight. Add in that low-gloss finish and the aged hardware and you feel completely drawn in to its vintage-like vibe. With superb-feeling weight, there’s nothing remotely boat anchor about this build. The neck is intelligently done, too, falling into what most would feel is late-50s spec. The Eastman features a 22mm deep neck at the 1st, filling out to 24.5mm by the 12th). There is silky smooth fretwork - beautifully rounded with perfectly domed ends. Quite superb. You could probably play this guitar for a considerable amount of hours and still find subtleties and shades that you hadn’t discovered before. The Eastman initially sounds a little polite and a little brighter at bridge compared with our reference ’57 Les Paul Jr and, with it, a little less punky. It’s a single-cut for those who like cleaner voicings, but they’re not sterile in the least. The neck pickup has a soupy fullness that doesn’t dominate and begins to work those volume and tones. There are also a host of colours: pull the volume down and find the sweet spot on the tone above, which it thickens, below, it thins - this is just one example. Dial in a taut Marshall crunch and climb into a jumpsuit and Doc Martins and, oh dear, this writer might just have found his alter ego. Yet it recalls so much more from surprisingly jazz-like thrum: some snappy funk and sophisticated soul to nasally cocked-wah classic rock. The Eastman is a straightforward drive and a hugely vintage-aimed piece that from its look, feel, playability and general vibe is simply superb. Price and value for money? Well, for a modern-quality production build, the Eastman sits perfectly when you consider the construction style, fine attention to detail and the quality parts. So, Eastman’s name should already be on your map for all the right reasons: style, build quality, sound and price. Ticks all round. Oh, and long live the classic P-90; now into its seventh decade, it remains the bridge between the vastly more popular Fender-style single coil and those early PAF-style Gibson humbuckers. Every player needs at least one!